Key Difference: Gastritis is a medical condition in which the internal stomach lining becomes inflamed or swollen. This is due to an increase in the production of the stomach acid. Ulcer is a disease that is caused by bacteria, Helicobacter pylori (H. pylori) bacteria to be exact. The bacteria produce substances that weaken the mucous lining causing the stomach to get burned. Gastritis and ulcers are two different types of medical conditions that take place in the gastrointestinal tract of the human body. Both are quite similar in nature, which is one of the reasons why many people often confuse both of these conditions together. They also share many symptoms, another reason why these two diseases are quite confusing. Gastritis is actually the inflammation of the stomach lining, while ulcers occur when the stomach lining develops holes through which the acid burns the stomach. Gastritis is a medical condition in which the internal stomach lining becomes inflamed or swollen due to excessive production of stomach acid. Causes for the inflammation vary depending on persons and can also include excessive alcohol consumption, continuous use of nonsteroidal anti-inflammatory drugs (NSAIDs) such as aspirin or ibuprofen, surgery, infections, burns, chronic bile reflux, stress and certain autoimmune disorders. Bacteria such as Helicobacter pylori, known for causing ulcers, can also be a reason for gastritis. When suffering from gastritis, the patient usually experiences abdominal pain caused by the stomach acid irritating the inflamed or swollen stomach lining. 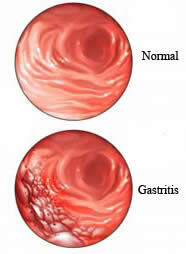 Constant gastritis can also cause ulcers. Web MD lists symptoms of gastritis as: nausea or recurrent upset stomach, abdominal bloating, abdominal pain, vomiting, indigestion, burning or gnawing feeling in the stomach between meals or at night, hiccups, loss of appetite, vomiting blood or coffee ground-like material and black, tarry stools. Gastritis is diagnosed using tests such as upper endoscopy, blood tests and stool tests. Treatment for the condition usually includes antacids (to reduce production of stomach acid), avoiding hot and spicy food, antibiotics (incase of bacterial infection) and lifestyle changes. Ulcer is a disease that is caused by bacteria, Helicobacter pylori (H. pylori) bacteria to be exact. This species of bacteria has a spiral shape that allows it to swim through the mucous lining of the stomach and produce substances that weaken the mucous lining. This causes the acid to burn the internal side of the stomach, resulting in the burning sensation and the pain the stomach. They can also attach to the cells of the stomach and cause inflammation, causing the stomach to produce excess acid. This disease may show symptoms or may not, making it much more difficult to diagnose. Ulcers can also occur on the skin and are known as sores and blisters. These cause the skin to become red and irritated, resulting in pain when touched or pressed. These sores are caused by exposure to heat or cold, irritation, problems with blood circulation or the lack of mobility. Peptic ulcers and duodenal ulcers are two of the most common types of ulcers that take place in the gastro-esophageal tract. Peptic ulcers take place in the stomach, while the duodenal ulcers take placed in the duodenum or the upper part of the small intestine. The least common type of ulcer is esophageal ulcers, which take place in the esophagus as a result of excessive drinking. Peptic ulcers cause sharp burning or gnawing sensation in the stomach, which gets worse when stomach is empty and better when it is full. The sensation also does not change with the position of the body, such as lying down or standing. The pain could also worsen if the person takes pain medication and better when they take an antacid. Other symptoms also include: weight loss, loss of appetite, bloating, burping, nausea, vomiting and black, tarry stools. I have been to the ER twice. Waves of nausea that even awaken me in the middle of the night. This has been going on for 12 days. I feel as if my own body is poisoning me. I now have been told I have gastritis but this diagnosis was made without tests. I am on a 2x per day acid reducer and anti nausea meds. I cannot get in to see a gastro for 4 more weeks. When can I expect to feel human again? Do I have to worry that I have an ulcer? WHAT A RUBBISH!!! Gastritis is a medical condition in which the internal stomach lining becomes inflamed or swollen. This is due to an increase in the production of the stomach acid. Ulcer is a disease that is caused by bacteria, Helicobacter pylori (H. pylori) bacteria to be exact. So H Pylori does not cause gastritis does it not?! It is quite possible for H. pylori to cause gastritis, however is often associated with ulcers as this bacteria causes a severe form of gastritis, which in turn causes ulcers to build up in the stomach. As I have already mentioned above that constant gastritis can cause ulcers to form. What one must understand that although these are two distinct medical conditions, it is not that they aren't related. 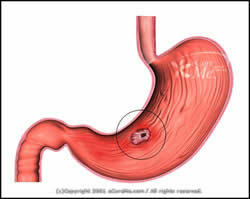 Constant gastritis can cause the lining to erode and burn through, causing a hole in it, resulting in an ulcer.